recently was completed after two years of construction. Photos by Ed Zdrojewski. The new 1.8-million-bushel Coop Country Farmers Elevator rail terminal east of Danube, MN (320-826-2161), has been drawing rave reviews from grain producers in that part of southwest Minnesota. “We’ve had nothing but compliments from our patrons. They love to dump there,” says Joe Hennen, assistant grain division manager. Hennen is a 30-year veteran of the grain industry and joined Coop Country in 1990, when his original employer, Olivia Farmers Cooperative, merged into the larger coop. Coop Country still operates a smaller 727,000-bushel elevator in downtown Danube primarily for hard red spring wheat and soybeans. However, Hennen explains, that location was difficult for truckers to navigate, and the in-town location left no room for expansion. The coop had the opportunity to purchase 56 acres east of town along U.S. Highway 212 and the Twin City & Western short-line railroad, which became the site for the new elevator. The coop hired J&D Construction Inc., Montevideo, MN (800-279-6447), as contractor and millwright on the project, which cost between $8 and $9 million over a two-year period. J&D built the bulk of the new facility in 2010, including three corrugated steel tanks, receiving, and loadout equipment. The facility was able to take grain, primarily corn with some soybeans, during the 2010 harvest. In 2011, J&D added a fourth, larger steel tank and a grain dryer. Two of the four tanks hold 400,000 bushels standing 90 feet in diameter, 66-2/3 feet tall at the eaves, and 98 feet tall at the peaks. In common with the other two tanks, they have inside stiffeners, 12-inch Sudenga bin sweeps, and no grain temperature monitoring. A set of four 20-hp GSI centrifugal fans provide 1/7 cfm per bushel of aeration. The big tank built in 2011 stands 105 feet in diameter, 93-1/2 feet tall at the eave, and 122-1/2 feet tall at the peak holding 750,000 bushels. This tank, strictly for dry corn, has four 40-hp centrifugal fans providing 1/9.5 cfm per bushel. The smallest tank, intended for wet corn, holds 270,000 bushels standing 72 feet in diameter, 72 feet tall at the eave, and 92 feet tall at the peak. Two 30-hp centrifugal fans provide 1/7 cfm per bushel. In addition to these tanks, a pair of 3,500-bushel Meridian overhead hopper tanks hold grain or screenings for loading onto trucks. The entire grain flow through the facility is under a control system developed for Coop Country by Automated Environments (AEI), Renville, MN (320-329-4340). The system gives the operator a choice of using traditional distributive-type control switches or a touch screen to operate the elevator. The facility receives grain by truck only. Truckers are directed to a pair of enclosed 80-foot inbound and outbound Webster pit-type scales. The inbound scale is serviced by an Intersystems truck probe, which delivers samples to the scale room. Testing equipment there includes a Steinlite moisture meter. From there, trucks are sent on to a pair of mechanical receiving pits feeding a pair of 15,000-bph Schlagel receiving legs. The legs are equipped with 20×8 Tapco CC-HD heavy-duty buckets mounted on a 22-inch Goodyear belt. The legs deposit grain into a six-hole Schlagel electronic Swingset double distributor, although the operator has the option of running grain first through a 16,000-bph Intersystems gravity screener. 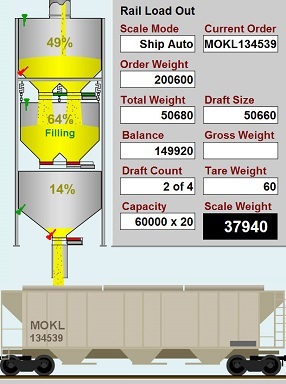 The distributor can send grain on to storage or the grain dryer, via 15,000-bph overhead Schlagel drag conveyors or to the surge tanks or the bulk weigh loadout scale via gravity spout. Storage tanks empty grain onto another series of 15,000-bph drag conveyors in above-ground tunnels, which run back to the receiving legs’ boot pits. The 7,000-bph Zimmerman grain dryer is fired by natural gas from a 6-inch main the local utility ran out from town. Hennen says the dryer, installed this year, had not yet been used, when Grain Journal visited the site at the beginning of September. Dry grain exits the dryer onto a 10,000-bph drag conveyor running back to a 10,000-bph Schlagel dry leg. Rail loading is accomplished with a 30,000-bph bulkweigher fabricated by J&D Construction and under the control of CompuWeigh GMS software. Hennen says the facility can load up to 25 railcars at a time, and the bulkweigher typically takes five to seven minutes to load a covered hopper car. Workers atop railcars are protected by a trolley unit from Fall Protection Systems running the length of five railcars.